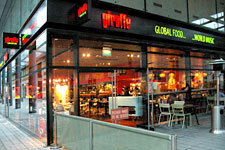 Growing family restaurant group, Giraffe, has built its reputation on offering global food and an eclectic mix of world music over a 15-hour trading cycle. Having developed a portfolio of 12 units over seven and a half years in the Greater London area, the company has this year moved to high-footfall, green-field locations — first on the promenade outside the Royal Festival Hall and now into the regenerated Spitalfields market. Run by partners, Andrew Jacobs, Russel and Juliette Joffe, Giraffe had been looking to standardise on its background music systems having been contracting its audio on an ad hoc basis early in its history. 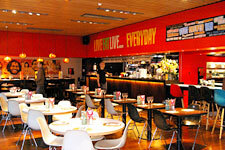 Drawn to The Sound Division Group via their marketing profile, Russel contacted managing director David Graham, which resulted in his company refurbishing the existing equipment in newly-acquired operations in Muswell Hid Wimbledon, before being offered the contract to install a full JBL system on the South Bank. 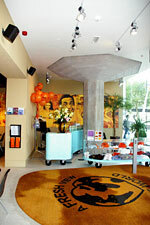 "The Giraffe concept is a global one — and music is a very important part of the overall experience," said David Graham. "The quality of the sound system needs to reflect this." In fact music assumes such high priority that the company markets its own CD compilations (via Putumayo World Music) as part of a vigorous merchandising operation. It also maintains a World Music Top Ten based around ethnic music from Brazil, Africa, Jamaica, The Caribbean, Cuba and the Celtic countries. The brief thus handed down to Sound Division was to provide high clarity and deliver a seamless mix of ever-changing music from 7.45am (when the venues open). The company has responded by supplying a Pioneer 25-disc multi CD player, feeding music to four distinct zones via a Cloud Z4 mixer and a selection of JBL Control 25AV, Control 28 and Control 24C (ceiling speakers). Recognising that the concept is constantly evolving, in both the South Bank and Spitalfields (where the latest Giraffe, opened last month) Sound Division have provided portable DJ systems based around Technics SL1210 turntables and Vestax PMC004 DJ mixers). These can be stored out of sight when not in use. However, the glass-shell building at Spitalfields required all Installation Manager, Elliott Patterson's EQing skills to tame a potentially reverberant room. Requiring a more potent music delivery during the evening trading session, Sound Division enhanced the specification, adding a JBL SB210 subwoofer in the main bar and drawing on the dbx Zone Pro 640 DSP to provide a full loudspeaker management system (with EQ, compression and routing capabilities as well as a fire alarm interface). The sound source and volume control can be overriden manually via local remote control panels. Juliette Joffe acknowledges that music is a vital ingredient in the company's winning formula, and is delighted with the impact of a premium sound system on the operation, as Giraffe contemplates a future which will see it move outside London for the first time. "While we are attempting to look at slightly larger units we are happy to operate from as little as 70-capacity up to 200 — including high street sites," she says. "It's all about finding the right locations." And currently these locations include Brighton, Bristol and Manchester as future roll-out potentials.